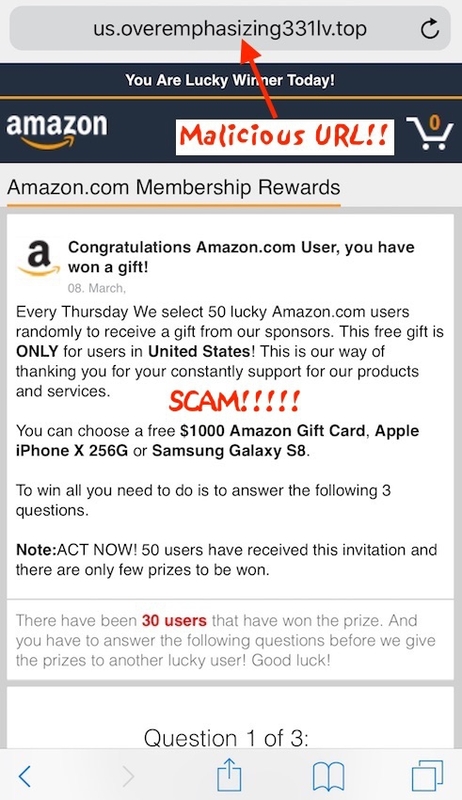 Are you receiving a random pop-up message or new Safari window (with an odd URL shown, not from amazon.com) about an Amazon gift you supposedly won? The message looks authentic because it uses Amazon logos and colors. Stop! Do NOT click the message OR answer the questions they tell you too! An example of the message is shown below. Notice, the message has poor English along with incorrect grammar and punctuation. You Are Lucky Winner Today! Every Thursday We select 50 lucky Amazon.com users randomly to receive a gift from our sponsors. This free gift is ONLY for users in United States! This is our way of thanking you for your constantly support for our products and services. You can chose a free $1000 Amazon Gift Card, Apple iPhone X 256G or Samsung Galaxy S8. To win all you need to do is to answer the following 3 questions. Note: ACT NOW! 50 users have received this invitation and there are only few prizes to be won. There have been 30 users that have won the prize. And you have to answer the following questions before we give the prizes to another lucky user! Good luck! DO NOT CLICK OR CONTINUE TO ANSWER THE QUESTIONS! This is a Scam! You likely receive this message because of a malicious app that is installed on your iPhone or iPad. Check recently installed apps on your device. Do not click the message! Close out of the message. If you cannot, swipe up to quit Safari. Clear the Safari web cache. Go to Settings -> Safari -> Clear History and Website Data. Finally, review recently installed apps on your iPhone or iPad and delete any app you may have recently installed that could be causing the scammy Amazon message to appear. It’s not an app on your phone - as long as your phone isn’t jailbroken, Apple locks apps down too much for them to be able to access Safari and do this. If you see one of these ads on an iPhone, just close the page and keep surfing. There is nothing wrong with your phone, and you do not need to uninstall any apps.